Oh dear August … where did you go? Sorry for the lack of posts recently. It’s been incredibly busy around here and I barely had time to breathe. Work has been crazy. The animals are constantly whining for something. The garden has exploded. The house has needed work. I can’t say that I will have the chance to share more in September, but I am going to try. This month is dedicated to trying to appreciate more and stress less. 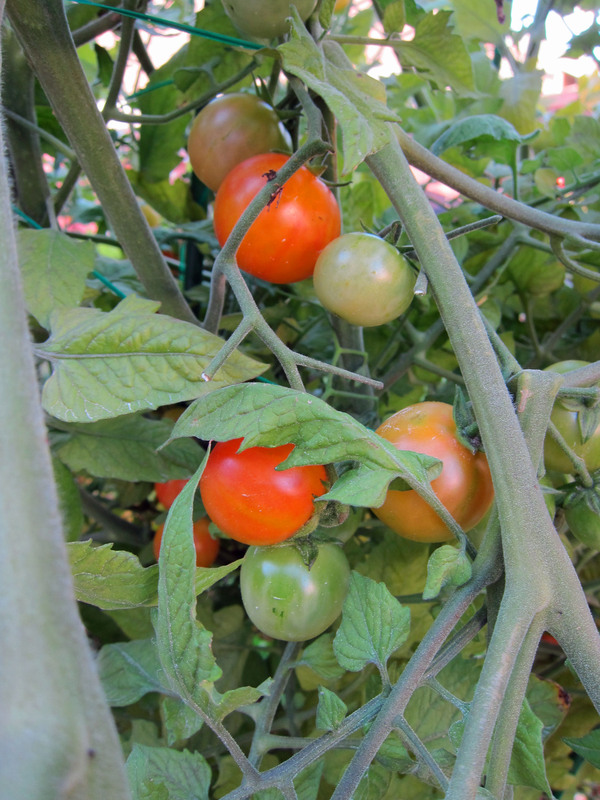 And in that vein, I thought there was no better to show my appreciation than to share the abundance of my tomato plants. I know they don’t look like much. They appear scraggly and a little weak, but I have been nothing but impressed by this year’s growing season. 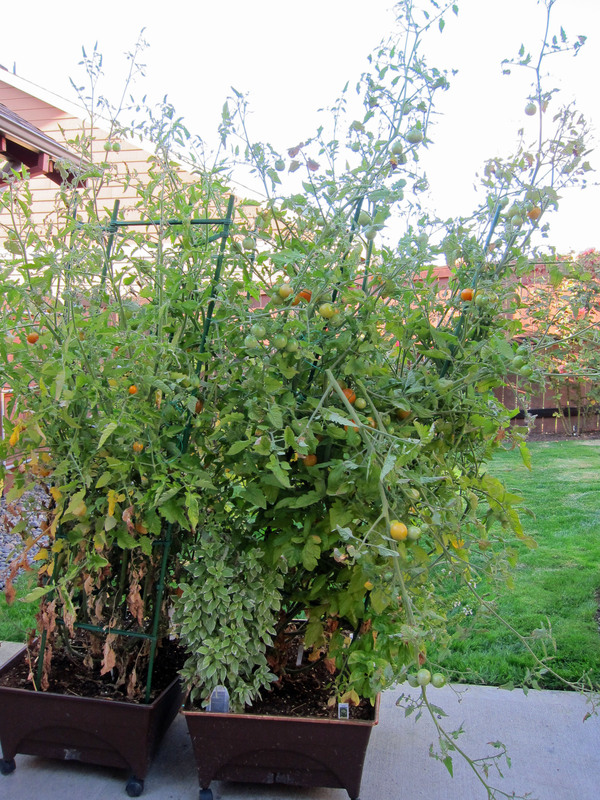 These cherry tomato plants started out as mere seeds just five months ago. Once I transplanted them into the rolling planters, I didn’t expect much. Maybe 5-foot plants with nice fruit. The plants not only exploded with greenery, they were covered with flowers. The first fruit started to appear in the middle of June — incredibly early if previous years were the norm. It was clear, as well, that not only were the plants going to be taller than usually, but the fruit itself was going to be two to three times larger than previous years. The growth seemed to stall during the heat of late June and July, but eventually, the fruit started to turn into the bright oranges and pinks and reds common in heirloom varieties. The stalks are now so tall and heavy with fruit that I have had to tie the support stakes of each planter together, as well as to the planters themselves, to keep the plants from toppling. But if that’s the worst I’ve had to endure this growing season, then I’d say I’ve had a pretty good summer. 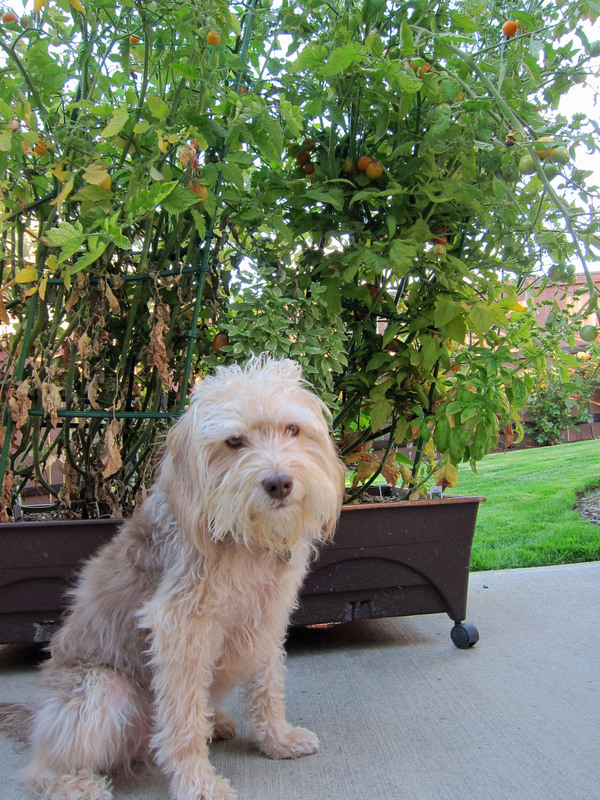 Doesn’t Cooper look happy to be posing in front of the tomato plants?